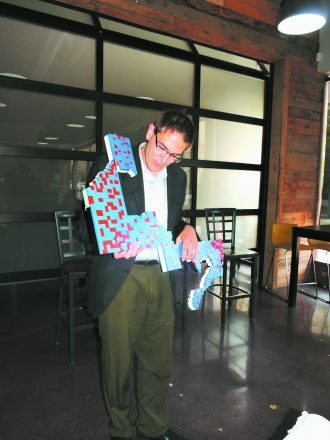 To best illustrate how and why Michigan politicians created the most stretched, tilted and gerrymandered congressional district in the nation, Dr. Kevin Deegan-Krause, Wayne State University professor of political science, showed up at the Office Coffee Shop in Royal Oak on Aug. 7 with a replica of the 14th District made of Legos. 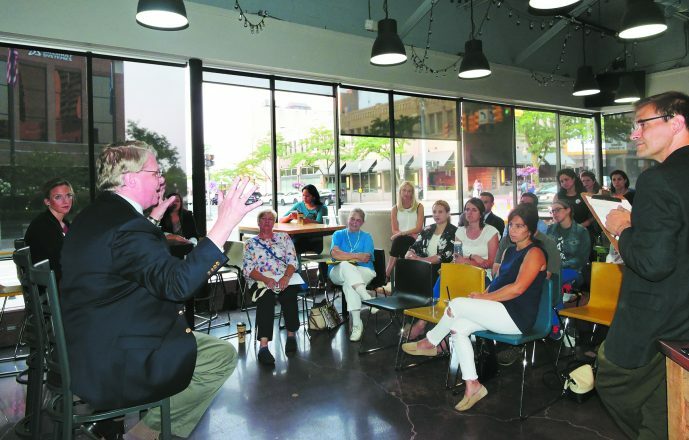 “The way our cities and towns are selectively inserted and removed into districts to benefit one party over another presents an elegant yet politically problematic design,” Deegan-Krause said to a group of about 30 gathered for an event sponsored by the Joint Action Committee for Political Affairs (JACII). Deegan-Krause moderated a discussion with the evening’s other two speakers: Mark Brewer, former chair of the Michigan Democratic Party, and Jocelyn Benson, former dean of Wayne State University Law School. Snaking around from Pontiac across to Farmington Hills and down to Harper Woods and Grosse Pointe Farms, the state’s 14th Congressional District is one of the most gerrymandered in the country. Created by a Republican state legislature in 2011, it placed as many Democrats into as few districts as possible — and wanted to create two districts with black majorities to comply with the interpretation of what the federal Voting Rights Act required, according to a 2014 article by Jack Lessenberry published in Dome magazine. Benson echoed Deegan-Krause’s statement by saying that the consequences of gerrymandering are felt when the everyday needs of the voter — such as transportation, infrastructure and healthcare — are not being represented and the minority party in the district wins by the narrowest of margins. Brewer is preparing a federal lawsuit over partisan redistricting in Michigan. In 2016, he was involved in a recount of the presidential election, where Donald Trump won Michigan by 10,000 more votes than Democrat Hillary Clinton out of 4.8 million votes cast. Republicans swept the state’s congressional districts, capturing nine of 14 seats statewide. Brewer said he is encouraged by a recent federal court ruling in Wisconsin that concluded the state’s Republican-led legislature crafted a plan for political district boundaries that skewed election results to be favorable to Republican wins. 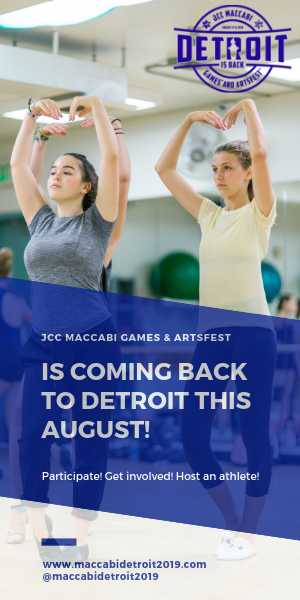 The event was part of a series of programs that the bipartisan Jewish political action group organized in recent months to inform how policy and legislation affect people in their daily lives. 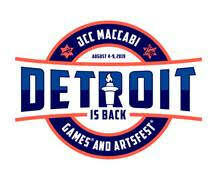 The group is planning with the national JACPAC for its annual Detroit event in the fall featuring elected officials. Mark Brewer, former chair of the Michigan Democratic Party, and Jocelyn Benson, former dean of Wayne State University Law School, held a panel discussion moderated by Dr. Kevin Deegan-Krause, WSU professor of political science.